Ancient Feminine Wisdom of Goddesses and Heroines, Divination Deck By Kay Steventon and Brian Clark Published by U.S. Games, Inc. 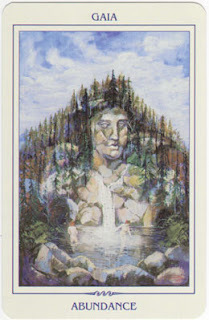 The wisdom of goddesses… we may discover it through myth and folktale, feel it through our connection to earth and sky, receive it in a dream or vision, or even recognize it in the words of a friend. It is something that can speak to us whatever our spiritual path. Wisdom resonates, and feminine wisdom exists in the depth of our women’s souls. The Ancient Feminine Wisdom divination deck shares the wisdom and insights of fifty-two goddesses and heroines, drawn from stories that have been passed down through centuries. The cards are divided into groups that can help us understand their significance in our lives. We begin by meeting the First Goddesses, and first among them, we are introduced to Gaia, who is referred to as “the mother of creation.” Other groups are Olympian Goddesses, where we find Hestia, Demeter, and Athena; Chthonic Goddesses, home to Cybele, Hecate, and Eris; the Guardian Goddesses, where we are offered the protection of Hygieia and Hebe. Heroines are grouped into the Heroine’s Journey, Lovers and Partners, the Power of the Heroine, and Virtues of the Heroine. Some of the heroines we meet are Psyche, Medusa, Penelope, Galatea, Medea, Cassandra, Antigone, Hesperides, and Auxo. Each card offers enough insights that full readings or multi-card layouts are not even necessary, although there are several layout ideas provided in the booklet, and a lovely custom spread sheet included with the set. It would be of benefit to draw just a single card each day, to set aside, meditate or reflect on, allowing the card’s wisdom to inform our actions. The author suggests lighting a votive beside the card as well, to become more in tune with, as well as to honor, the energy or wisdom of that particular goddess or heroine. These are gentle cards, beautifully depicting the goddesses or heroines, and offering insights in a direct but quietly reflective manner. The deck would be highly recommended for anyone who wishes to pursue ancient feminine wisdom, Greek goddesses in particular, and who likes the interactive nature of using oracle cards.